​​The mini skid steer range of attachments can further assist you in your tasks when working on construction, building, gardening or landscaping projects. All the mini skid steer attachments comply with health and safety regulations and can help improve work conditions and standards. ​These compact mini skid steer loaders are very versatile and will save extra manual labour and reduce maintenance costs on the long run. 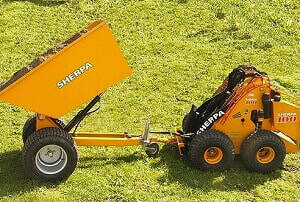 Suitable for heavy loads, using the dumper gets the work done in no time without breaking your back. Perfect in the construction, building and gardening sectors, the mini skid steer dumpers will transport sand, rubble, soil and other materials with ease. 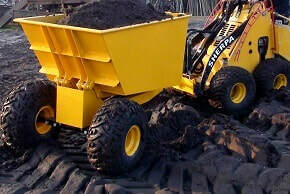 These dumper attachments are designed for the mini skid steer 100 models as well as the 150 mini loaders.